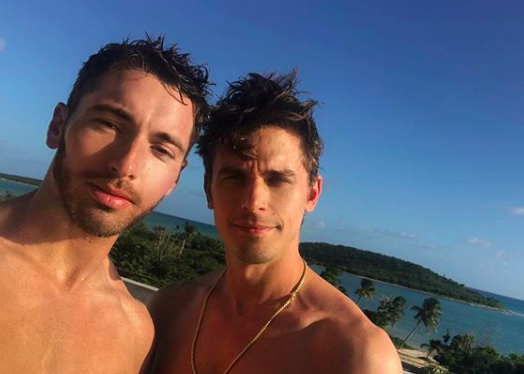 In case you didn’t know, Antoni Porowski from Queer Eye and Trace Lehnhoff from Flipping Out are boyfriends. The guys have been dating since last summer but didn’t go public with their relationship until December when they shared posts on their social media pages. “11 is my favorite prime number,” Porowski captioned an adorable photo of himself and Lehnoff standing side by side on December 11. On Wednesday’s episode of Watch What Happens Live with Andy Cohen, Porowski revealed exactly how the guys met. Like many gay men, they first connected online. And, no, it wasn’t on Grindr. It was much more innocent than that. That’s right, folks. Porowski and Lehnhoff have Instagram to thank for their newfound romance. Sweet, huh? A little Puerto Rico throwback with this guy. Flashback to this weather (and these tans!)? Since every selfi Queen links their instagram account to Grindr it really isn’t that different. It’s just allot more pics to look through. Oh boy, the romantic adventures of yet another two people with model looks who no one will remember 20 years from now..oh how you thrill me Queerty!! I think I’ve seen your comments on other Queerty articles. If you don’t like Queerty’s articles, why do you keep returning and reading them? jealous much??? shut the “f” up. queen!!!! Nitejonboy is quite right…. model looks…. I don’t know why it gives me such pleasure to see other people’s happiness…..it’s almost as if a little bit rubs off …..
That second pic of them in suits is a a little too “The Shining” for my tastes, but hey, good on ’em. 2 pretty boys met online. This is news? It made you look, didn’t it? Nice, Mr. I’ll eat your neighbor’s dog but not your horse is now dating Ms. Plastic, nice. if you want to encourage and inspire young people struggling with their sexuality and relationships, show some “regular” people meeting and loving and having relationships and happiness and not just celebs and models. Good luck to them. They are young, good looking, in love perhaps and the world is at their feet. Make the most of it and enjoy as you never know when it may be ripped away (hopefully never). So the relationship is basically a photo op for them, yae that will last. Attractive couple, they seem well matched physically , career-wise and temperamentally. Minor celebrities with good solid careers. I wish them all the best, they seem like nice guys. Cute couple and I’m happy for them, but, dudes, tone down all the public display of your lives details. It may turn very ugly at so many levels. Trace was always such a weird creeper on Flipping Out. Antoni will hopefully wake up. I know some straight couples that met through Instagram. I’m glad these two found one another although two pretty boys that look identical connecting doesn’t exactly scream love. I think they’re just attracted to themselves. Let’s see if they’re still together five years from now. The odds are against them. Thank god they were innocent and met on Instagram. God forbid they be sluts like my husband and myself who met on Scruff 5 1/2 years ago and have been happily married for almost 4 years. I think people should keep in mind that it doesn’t really matter where two people meet if they make a connection. I know another couple who met in a bath house in Chicago in 1993. They are still together nearly 29 years later. Oh, congratulations on finding your happiness. I love a good love story.